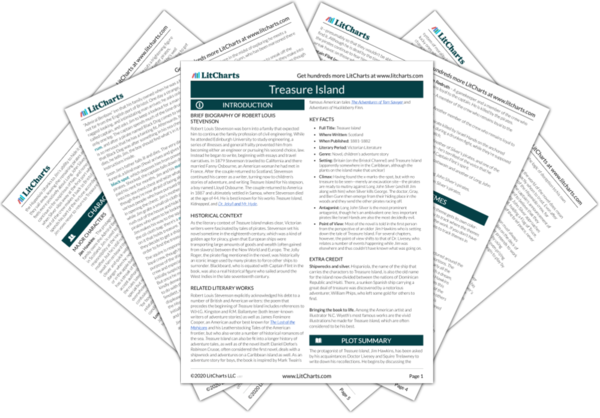 Instant downloads of all 942 LitChart PDFs (including Treasure Island). 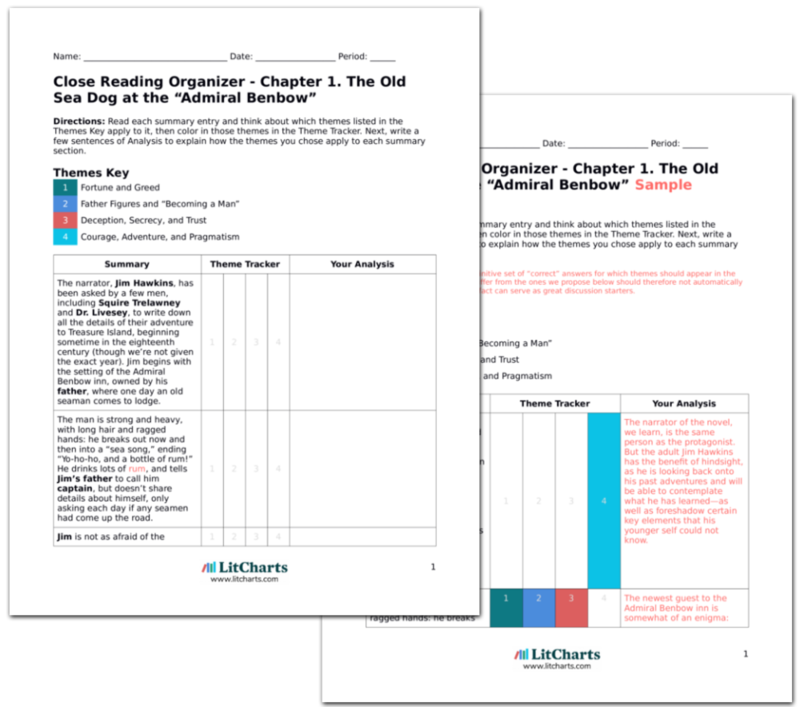 LitCharts assigns a color and icon to each theme in Treasure Island, which you can use to track the themes throughout the work. Outside the stockade it’s just Silver and another pirate. Smollett tells the others to stay inside, as it could well be a trick, and to keep a look out on all sides. Silver’s servant says that “Cap’n Silver” has come to make terms. Smollett says that he’ll allow Silver in—any treachery will be on the other side—but Silver laughs and says the captain is a gentleman. The captain is well aware that Silver’s protestations of truce and fairness don’t mean that much, unless it’s in Silver’s own best interests to maintain the truce. Silver has little more than scorn for the captain’s own sense of dignity and fairness. Silver limps up the knoll to the log-house. When Silver asks why he won’t be let inside, Smollett declares that he can either be an honest ship-cook or “Cap’n Silver,” a mutineer and pirate, in which case he’s worth nothing. Unfazed, Silver greets Jim cheerfully. He acknowledges that they made some good shots the night before, but that it can’t happen again. Smollett doesn’t let on how confused he is, though Jim suspects that Gunn had snuck up on the pirates and picked a few of them off. Smollett creates an either-or choice for Silver: just as Silver has been trying to convince others to join his side, Smollett declares that Silver must choose one side or the other, rather than constantly play each group off each other. Silver is, as ever, able to adapt easily to any situation, and remains unaffected by others’ suspicions of him. Silver says that all the pirates want is the treasure, while Smollett and the others presumably want to save their lives. He demands that the captain give him the treasure map. The captain coolly refuses. They both light a pipe and silently sit, smoking. Silver again asks for the chart: if he gets it, they can either come aboard with the pirates and be left at another port, or they can stay on the island with provisions. Silver’s suggestion is one possibility, which seems rather attractive, and yet it depends on the captain putting his trust in Silver and the other pirates—something that he’s unwilling to do. Instead, each man continues to study the other, as if to predict the other’s mind and moves. Smollett, in turn, says that if the pirates surrender unarmed, he’ll take them back to England for a fair trial: if not, he’ll see them “to Davy Jones”—that is, kill them. They can’t find the treasure and there’s none among them who can sail the ship. The next time he sees Silver, the captain concludes, he’ll shoot him straightaway. Suddenly furious, Silver roars for someone to help him up: no one does, so he crawls to the porch and hoists himself up, then spits on the ground, saying that’s what he thinks of them. In an hour, he’ll be ready for battle, he says, and limps off. Now the captain proposes his own plan, which Silver can take or leave. But the captain is eager to emphasize that Silver is at a disadvantage here. Ultimately, the captain refuses any kind of treaty or compromise: he will fight the pirates for the treasure. Seeing that his scheming has come to nothing, Silver immediately sheds all pretense of friendliness. 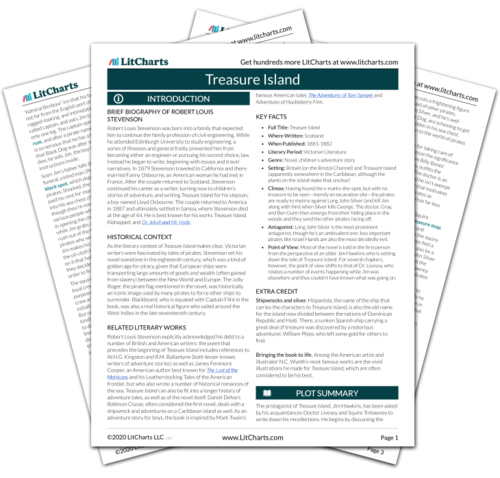 Get the entire Treasure Island LitChart as a printable PDF. Baena, Victoria. "Treasure Island Chapter 20. Silver’s Embassy." LitCharts. LitCharts LLC, 6 Jan 2017. Web. 20 Apr 2019. Baena, Victoria. "Treasure Island Chapter 20. Silver’s Embassy." LitCharts LLC, January 6, 2017. Retrieved April 20, 2019. https://www.litcharts.com/lit/treasure-island/chapter-20-silver-s-embassy.